There are now many portable sawmills across the country and many experience operators who can help farmers turn a fallen log into a promising stack of sawn boards. As the landholder draws up plans for using their home grown timber in farm buildings, fencing or even turning their hand to making a piece of furniture, the timber begins to dry. That's when the problems start. There is a long list of defects that can arise during the drying process: End splitting, cupping, warping, surface and internal checking, collapse etc. What begins as a clean straight board can end up as a twisted and torn wreck - expensive firewood! Whilst some species are particularly difficult to dry, having a relatively simple understanding of the drying process and some knowledge of how to set out a stack of green timber will ensure you avoid most of the problems. By convention, the moisture content of wood is calculated as the weight of all the water in a piece of timber relative to its oven-dried weight. It is easy to calculate the moisture content of timber by taking a sample, weighing it, then placing it in an oven at around 100oC. To test if the timber is dry the sample is repeatedly weighed until it remains unchanged. Small samples of light, porous timbers, like pine, will dry out completely in about 6 or 8 hours. Heavy, dense timbers, like Ironbark, might take a few days. For a more immediate and less destructive measure of moisture content millers use electronic metres. Based on the electrical conductivity of the timber between two pins the metres estimate the moisture content. When using a moisture meter it is important to test a freshly sawn surface and correct for differences between species using the tables provided with the instrument. The moisture content of green timber can range from as low as 25% to more than 100%. The heartwood of mature Red Ironbark, for example, has a moisture content of only 27% when green which is much less than the brown coloured Spotted Gum (55%) or the pale coloured eucalypts like Manna Gum (100%). The ease of drying will depend on the wood structure and whether or not water is able to move freely between cells. The heartwood of most species is more difficult to dry than the sapwood because the pits between the cells are often blocked with extractives. The moisture content of timber is critically important if it is to be used in applications where excessive movement is unacceptable, such as for furniture or flooring. Because timber absorbs moisture from the air the desirable moisture content will depend on the temperature and humidity of the environment where it will be used. 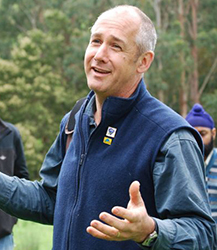 In Victoria, a moisture content of around twelve per cent is generally seen as desirable. In the humid tropics slightly higher levels may be acceptable. If the timber is to be used in air conditioned offices a moisture content of less than ten per cent may be specified. These figures reflect the fact that dried timber will expand and contract with slight changes in moisture content. We've all seen floors buckle and doors jam during periods of high humidity or the gaps between floor boards during summer. The extent of movement varies between species and may differ with the sawing pattern used. 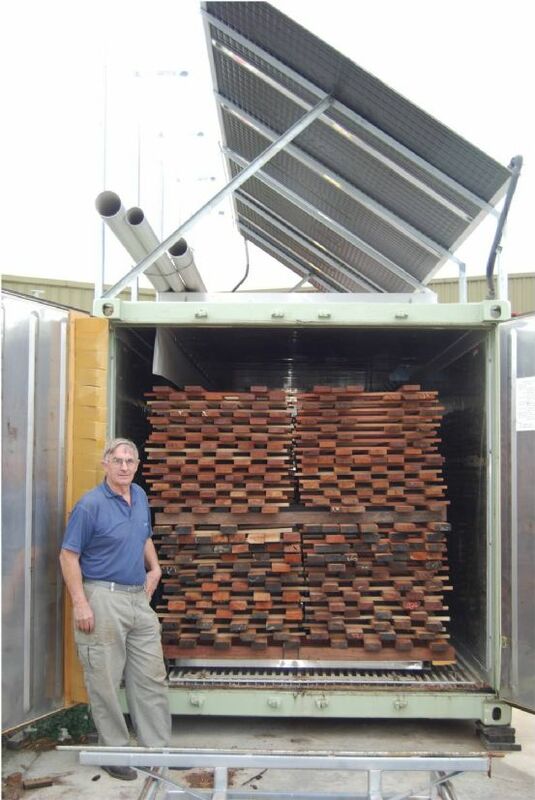 The most stable timbers are often those that have dark coloured heartwood, indicating the presence of extractives that displace water in the cells. Most of the moisture in green timber is what we call 'free water' meaning it simply occupies the wood cells and voids between them. As timber begins to dry out the free water is drawn to surface and evaporates leaving only the water that is bound into the cell walls. This stage is called the Fibre Saturation Point. Most problems, such as splitting, checking and warping, occur as the water that is bound into the cell walls is removed causing the cells to shrink. However, some drying problems can start almost immediately after the timber is removed from the saw. Collapse is a condition that is common in some of the lower density eucalypts. This occurs as the water is pulled out of the cells. Imagine sucking water out of a straw. If you held the bottom of the straw to prevent more water replace what is being drawn out then the straw itself would collapse. The same occurs if water is pulled out of the wood cells too quickly creating a vacuum. To 'pop' the cells back into shape the timber can be steam reconditioned although this requires a chambers and boiler. Whilst the dense eucalypt species are less susceptible to collapse they have their own problems. If the surface of the timber dries too quickly the free water in the centre of the board can be trapped. This is called 'case hardening' and leads to excessive checking as the wood on the surface tries to shrink around a core that remains unchanged. Similarly, end splitting of sawn boards results from the loss of moisture out the end grain. This can be slowed by coating the ends with a special log-end sealer or water-based paints. To avoid all types of drying degrade the key is to remove the water slowly whilst maintaining a gentle and even moisture gradient from the centre of the board out to the surface thereby allowing the cells to shrink together. The thicker the board the more careful you will need to be. Unless you have some experience with the species and know how hard you can push the drying process the best option is to be conservative - take you time. 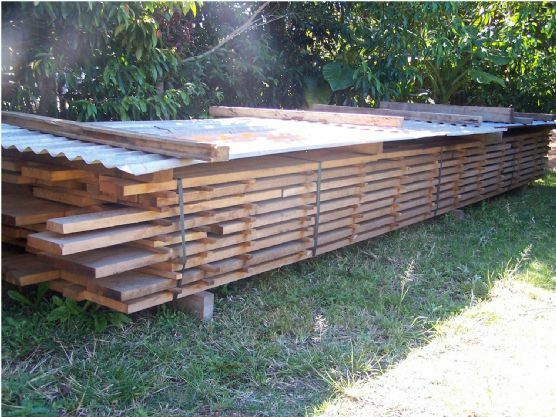 Below is a simple guide to stacking and air drying sawn timber. Depending on your environment you may need to finish the drying using a make-shift solar kiln to achieve the moisture content required for furniture or flooring. If you are patient, you can produce a very high quality product without much investment. Milling should be done under cover out of direct sunlight. If this is not possible avoid working on hot sunny days or have a spray system available to keep the freshly sawn timber wet. Within a few hours of milling all the green timber should be stickered out into even stacks and protected from the sun and drying winds. For stickering you'll need a large number of even-sized sticks of about 25 mm thickness and as long as the width of the proposed stack (usually 1.2m). It is best if the sticks are already dry and of a similar species to that being milled. If unavailable, fresh sticks can be sawn at the same time as the boards but accuracy is critical. Whilst it is desirable to only stake timber of the same dimensions together this may not always be possible. Nonetheless, each layer must be made up of pieces of the same thickness. A firm flat surface is required to start a stack. It is worth spending some time levelling out a site and laying bearers every metre or so to carry the first layer. Beginning with thick boards of full length lay out the first layer so the boards are just touching. Then, set the stickers across the top at an even spacing of around 30 to 40cm starting within 10cm of the ends. Repeat the process to build a stack no more than about 60cm tall. Then, using strapping, tie the pack together tightly. If you are unable to move the stack make sure it is in a shelter area with free air flow around and under it. To slow the drying process you can cover the stack with black plastic leaving the underside open to allow the condensation to drop out. Alternatively, a 'roof' of corrugated iron can be built over the top with eves to ensure the sides are protected from the sun. A better alternative is to put the stack in a walled shed, leaving spaced for air circulation. To avoid timber movement it is a good idea to put a heavy weight on top of the stacks. The weight could be specially made concrete beams or simply barrels filled with water. Air drying down to a moisture content of below 20% might take as long as six months or even a year. At this stage the timber could be used for general construction, rough decking or cladding. For higher quality end uses the timber will need to be 'finished' to the locally appropriate moisture content. Because most of the shrinkage will occur below 20% moisture content it may be worth sorting through the air-dried timber and re-stickering the best boards into a new, tight pack for final drying. If you don't have access to a commercial kiln then the stack could be moved into a poly-house and air pushed through the timber using a large fan or natural convection. A sample board of the same species and thickness should be placed in the stack and regularly removed to test the moisture content. When the sample reaches the right moisture content it is advisable to then cut through a few boards to ensure that they are even to the core. If you plan to sell your timber it is critical that you are able to demonstrate that the timber has been properly dried. 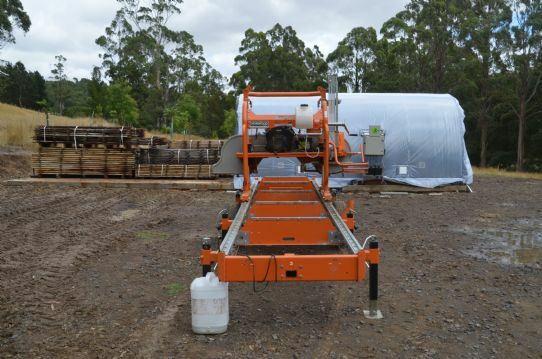 If you have time, drying timber need not require expensive equipment. With care a high quality product can be produced from almost any of our native species. Good luck.